The first day of June was on point for me. I met my water goal for the day and also stayed within my calorie range! The vast majority of my calories were good, meaningful calories, too. Meaningful calories such as vegetables, eggs, chicken, hummus (and two very important tablespoons of mini milk chocolate chips). Eh, meaningful calories as in they meant a lot to me, okay? It was a nice little treat. Last night, I made a short-cut meal for dinner. 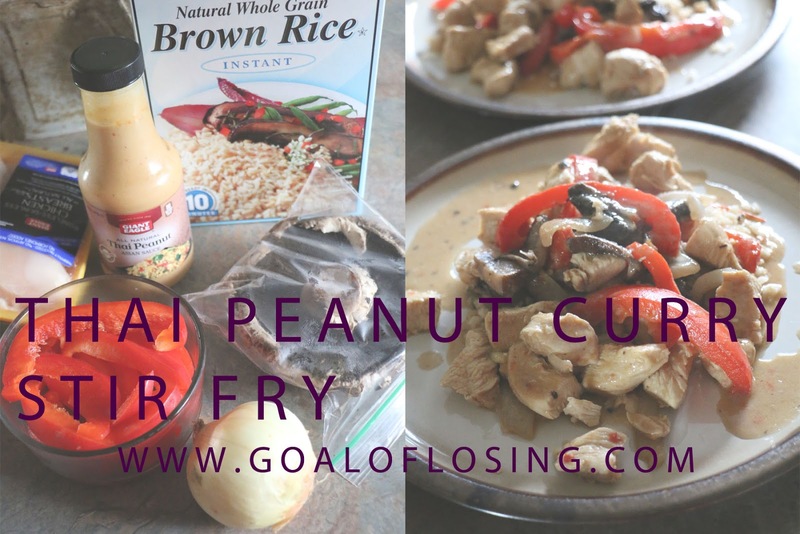 Thai Peanut Curry Stir Fry. Delicious! I call it a short-cut meal because I didn't actually make the thai peanut sauce; I used a bottle, instead. It was really yummy and quick to make! In a bowl, add chicken and thai peanut sauce. Toss and let marinate for anywhere from 10 minutes to 2 hours in the fridge. Meanwhile, add about a tbsp. of olive oil to a skillet, and begin cooking sliced vegetables on medium heat. In a separate skillet, add chicken and cook over medium heat. Stir often, cook until chicken is to temperature. Cook rice as directed, let stand. Drain vegetables of any water, add vegetables to chicken skillet. Simmer on low a minute or two, stirring to coat all vegetables with thai sauce from chicken. Serve and enjoy! This meal reminded my husband of Bang Bang Chicken and Shrimp (minus the shrimp, of course) from the Cheesecake Factory. It was super easy and made at a fraction of the cost! Readers, what is your favorite thai dish? Have you ever cooked with thai peanut sauce, before?